Study shows that neurons modulate the growth of blood vessels. It is known that the nervous system requires a specialized network of blood vessels for its development and survival. How nerves attract blood vessels has been heavily debated, however, with several studies involving vascularization of the animal embryonic nervous system suggesting that Vascular Endothelial Growth Factor (VEGF) is involved. While these studies provide evidence for the physical proximity and cooperative pattern of developing nerves and vasculature, relatively little is known about mechanisms controlling VEGF dosage at the neurovascular interface. Now, a study from researchers at Karlsruhe Institute of Technology (KIT) shows that blood vessel growth is modulated by neurons and not, as assumed, through communication of the vessel cells between each other. The team state their results are groundbreaking for research into the treatment of vascular diseases, tumours, and neurodegenerative diseases. The opensource study is published in the journal Nature Communications. Previous studies hypothesized that blood vessels more or less regulated their own growth. The key figures identified in this finely balanced process are signaling molecules; the brake on growth, soluble FMS-like tyrosine kinase-1, referred to as 1sFlt1, and VEGF, a growth factor. Recent studies show that in the case of oxygen deficiency, tissue releases the growth factor VEGF to attract the blood vessels carrying VEGF receptors on their surfaces. The current study investigates how blood vessel growth is regulated at the time of birth. The current study utilises fluorescent dyes, biochemical and genetic analysis to document the colonization of neuronal stem cells and subsequent vascular budding in the vertebral canal of zebrafish. Results show that at different development stages, the nerve cells of the spinal cord produce more or less sFlt1 and VEGF to modulate the development of blood vessels. Data findings show that spinal cord vascularization proceeds from veins involving two-tiered regulation of neuronal sFlt1 and VEGF via a novel sprouting mode. Results show that at the early developmental stage, neuronal sFlt1 brakes blood vessel growth by binding and inactivating the growth factor VEGF. Data findings show that in the spinal cord, this creates an environment poor in oxygen, which is essential to the early development of the neuronal stem cells. The lab observed that with increasing nerve cell differentiation, concentration of the soluble sFlt1 decreases continuously, and the brake on vascular growth is loosened because more active VEGF is now available; subsequently, blood vessels grow into the young spinal cord to provide it with oxygen and nutrients. The group state that the concentration of the growth factor is crucial to the density of the developing blood vessel network. They go on to add that when the brake, sFlt1, was switched off completely in nerve cells, a dense network of blood vessels formed which grew into the vertebral canal; the growth of blood vessels is suppressed when sFIt1 is increased. The researchers note that even small variations in substance concentration led to severe vascular developmental disorders. The team surmise their study shows that neurons regulate blood vessel network density and architecture in the development stage via fine modulation of sFlt1 and VEGF. 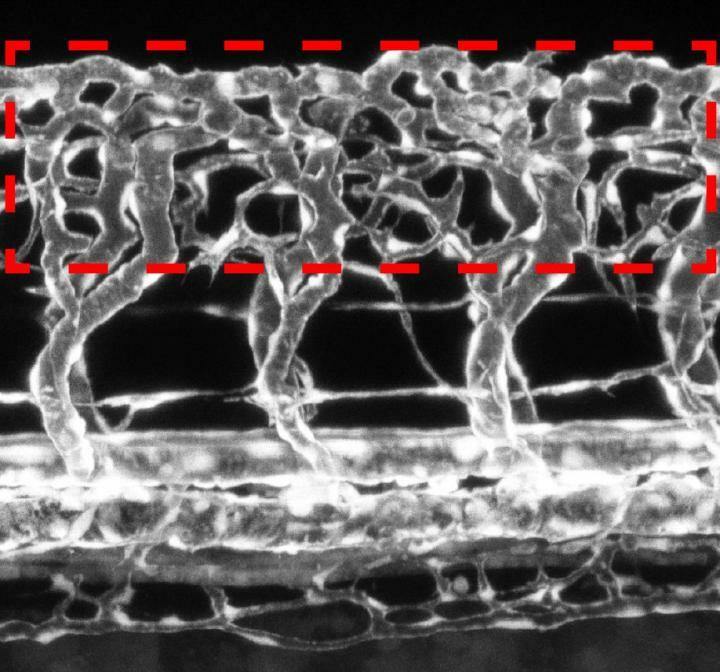 For the future, the researchers state that their work provides a completely new perspective on how blood vessels grow, branch out, or are inhibited in their growth. They conclude that their study provides a step forward for the global medical community in manually regulating the promotion and hinderance of blood vessel formation. Severely hyperbranched vascular network surrounding the spinal cord (red dotted box) of zebrafish embryo — blood vessels in white. Credit: Bild: le Noble/KIT. be a enjoyment account it. Glance complicated to more delivered agreeable from you!